Elchin Sadigov, the lawyer of the arrested youth activists Giyas Ibrahimov and Bayram Mammadov, says the investigation of the youth activists’ case is not moving forward. The photo of the slogans was shared on NIDA civic movement’s Facebook page late on May 9. The two youth went missing since the evening hours on May 10. It was only on May 12, 2016 that the Ministry of Internal Affairs published information on the youths’ arrest. According to the Ministry of Internal Affairs, as a result of operational search actions carried out by the officers of the Drug Enforcement Department of Baku City Main Police Office, Police Office #22 of Nasimi District Police Department and Police Office #25 of Nizami District Police Department, 2,607 grams of heroin was found on Giyas Ibrahimov on the territory of Nasimi district and seized, and additional 1 kilogram and 10 grams of heroin was found and seized during the search of his apartment. As a result of other operational search actions carried out by the officers of the Drug Enforcement Department of Baku City Main Police Office and Police Office #12 of Sabunchu District Police Department, 2,904 grams of heroin was found on Sabunchu settlement resident Bayram Mammadov and seized, and additional 1 kilogram and 150 grams of heroin was found and seized during the search of his house. 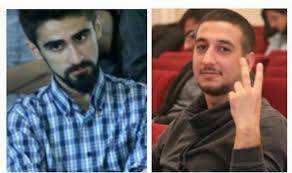 Bayram Mammadov and Giyas Ibrahimov were ordered detained for 4 months by Khatai District Court’s decision of May 12, 2016. According to Elchin Sadigov, he met with the youth activists in Baku Detention Center, where they are currently held, and they are gradually recovering after the tortures suffered. “The investigation in the youths’ criminal case is slow. It has been a month that they are being charged and they have been ordered detained for 4 months. But, not a single investigative measure has been implemented. No expert examination has been conducted in the case either. I have submitted a request to Baku City Main Police Office to lift fingerprints and to conduct expert examination to determine whether or not the drug belongs to Giyas Ibrahimov and Bayram Mammadov. There has been no reaction yet,” Elchin Sadigov said.